What is FLUORESCENCE? …. and PHOSPHORESCENCE? It’s all about Ultraviolet Light (or just UV Light or even just UV). UV light comes in a whole range of “colours” that we can’t see. Some birds, animals and insects can see it. It’s what we could call High Energy Light, and its high energy can sunburn you or destroy some materials (especially plastics) if they are left exposed to it for a long time. Only about 10 -15% of all minerals glow when subjected to UV light. They are the Fluorescent Minerals. UV stirs up electrons in the mineral’s atoms, and they jump to a higher than normal orbit. But Physics requires them to go back to where they came from, and when they do that they release the extra energy they got from the invisible UV as visible light. We call this Fluorescence. This, and the following explanation of phosphorescence, are hugely simplified. Some of the electrons in certain fluorescent minerals do something else as well. They wait for a while before dropping back, and keep doing it after the UV lamp has been turned off. 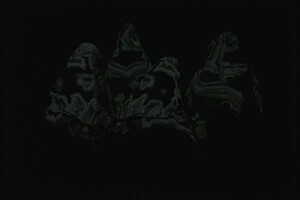 That causes their rock to continue to glow after the UV light is turned off. This is Phosphorescence, sometimes called afterglow. Phosphorescence dies away sometimes quickly, sometimes slowly. Usually you only get a fleeting view of it because it soon becomes so dim that the human eye can’t see it. (A camera can!) Phosphorescence can be a similar colour to the fluorescence it follows, but can also be quite different. Images captured by a camera can be quite spectacular. Can you imagine going to see a fireworks display in the middle of the day? Daylight would completely swamp the fireworks colours and you wouldn’t see anything (except the smoke). It’s like that with fluorescence and phosphorescence – you can only see them at night or in a dark room. Sunlight contains many UV colours, the commonest called UVA, UVB and UVC. UVC is filtered out by the atmosphere and so doesn’t make it to the ground. UVA and UVB get through. Therefore many minerals out there in the hills fluoresce all day every day – but you can’t see them doing it. You have to wait until after dark and create your own UV with a UV lamp. UV lamps can make all three of those common UV colours. UVC (also called short wave UV) is widely used to kill germs, UVB (or mid-wave UV) surnburns you and so is used in solariums, and UVA (or long wave UV) is used in clubs and discos to make your clothes and your teeth glow. They all cause mineral fluorescence, but UVC makes about 10 times as many minerals glow as the other two do. OK. So Fluorescence, although weak, shows up nicely in a dark room with a good UV lamp. However, Phosphorescence is tens, hundreds or sometimes thousands of times dimmer than the fluorescence it replaces when the UV lamp is turned off. It is often hard to see even before it dies away. It can be very difficult, usually impossible, to tell exactly what colour it is, especially if there is more than one colour (which can happen when there is more than one mineral in the rock). It’s like being outside when some clouds start to go across a full moon. Initially you can just make things out, but you have no idea what colour they are. Then as the moon goes behind a cloud your scene gets dimmer and dimmer and soon you can’t see anything at all. The brightness of fluorescence and phosphorescence can vary greatly from rock to rock. One fluorescing rock might light up the whole area around it whilst another, held at the same distance from the same UV lamp, might show just the tiniest almost imperceptible glow. So why are all my photos almost uniformly bright? Have I only included photos of brightly glowing rocks? There are two views on what is the right brightness of a fluorescence photo. One view is that your exposure setting should give an image as near as possible to what you see when you look at the rock under a similar UV lamp. 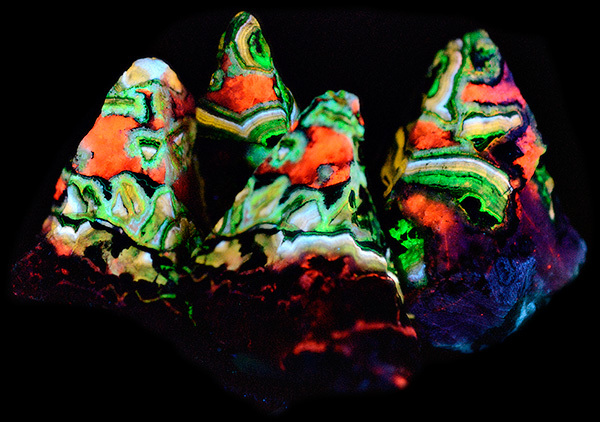 Thus, brightly fluorescing rocks should produce beautiful bright photos, and weakly fluorescing rocks should result in uninteresting dull photos or no photo at all. The other view is that the exposure settings you use should produce the nicest possible image. My view is the second one. I justify it by referring to the magnificent images produced by the Hubble Telescope. Whatever object Hubble is photographing, the astronomers use exposure settings that will result in the best possible images. 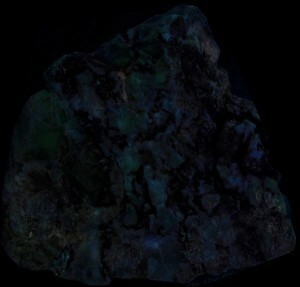 If my rock is fluorescing even a little bit I want my photo to show that fluorescence in the best possible light. (Sorry!) 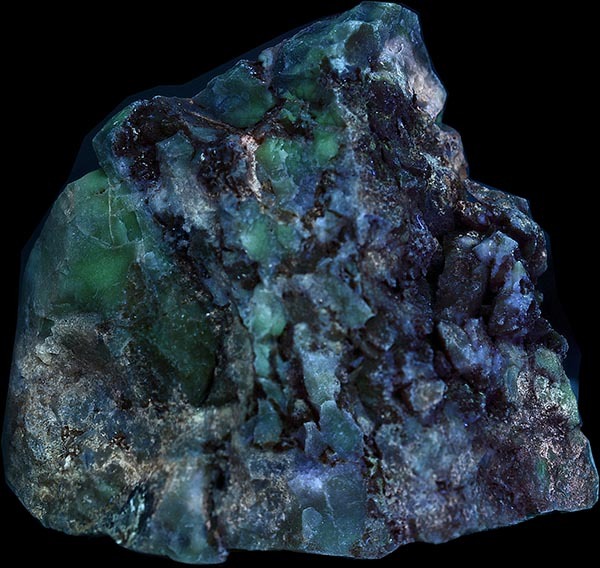 The first photo below shows a rock whose fluorescence is so weak that some people would classify it as of no interest and not worth photographing. I disagree! The second photo has many times the total exposure of the first, and shows details of the weak fluorescence. Photographing phosphorescence, which is usually both fleeting and orders of magnitude dimmer than fluorescence, would be pointless if the photo had to show exactly what is seen by the unaided eye. Indeed, a lot of phosphorescence can’t be seen at all by the unaided eye, just as hundreds of billions of stars and galaxies can’t be seen without the help of telescopes and astronomical cameras. But dim fluorescence and phosphorescence are as real as distant stars and galaxies and can be photographed to give photos that are just as valid and just as arresting as any bright fluorescence photo. The first photo below shows the phosphorescence you see very soon after the UV is switched off. Before you’ve had time to have a good look at it, it fades away to what seems to be nothing at all. It’s actually still phosphorescing, but below the threshold of the human eye. However, with a wide aperture, a high ISO and plenty of time, a good camera will accumulate an image like that shown in the second photo. These four little pyramid shaped rocks broke just the way they are when I sledged a larger rock. The field of view of the photo is about 12cm (4.5 in). This is a complex photo. 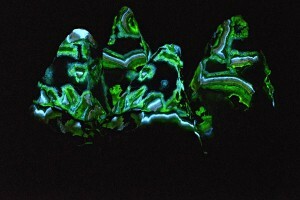 It contains four distinct “glows”: Short Wave fluorescence and phosphorescence as well as Mid Wave fluorescence and phosphorescence. Mid Wave fluorescence and phosphorescence in these rocks are both dimmer than their Short Wave counterparts by a factor of around 2. As indicated above phosphorescence is dimmer by a factor of 1000 – 2000. * If your maths isn’t too rusty, the amount of light reaching a camera’s sensor varies directly as the shutter speed and ISO and as the square of the aperture diameter (or inversely as the square of the f number). So increasing the shutter time by 30 times, increasing the ISO by 40 times, and increasing the aperture diameter by 1.6 (= 5.6/3.5) means the total exposure value for the phosphorescence photo is 30x40x1.6×1.6 or 3840 times that for the fluorescence photo.